I'm so happy to be reading novels in verse again. 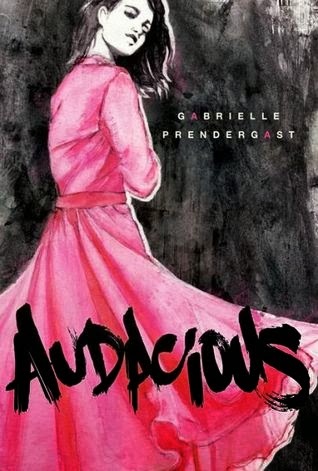 I received an advanced copy of Audacious from the author, Gabrielle Prendergast. I'm a reader of her blog, which is smart and challenging, exactly like her novel. Raphaelle's family has moved to a new home and she plans to no longer be an outcast; she will be more like her younger sister, taking on the name Ella. Yet, despite her attempts to fit in, her true self and the problems of her family can't remain hidden. Raphaelle finds safety in her artwork and is bolstered by a new boyfriend, Samir. Feeling bold, she pushes the limits with her art and creates something controversial, but the boundaries she has pushed bring out the worst in her new community. Raphaelle needs to actually be audacious in order to accept the consequences of her actions. I loved the characters in Audacious because they were authentic. Although there are stereotypes that they could fit into (the bulimic, the alcoholic, the religious zealot, the party girl), the characters show other sides to themselves that round them out and add to Raphaelle's world. Prendergast has a gift for storytelling; Audacious flows and makes the reader want to know what will happen next. With so many unravelling dramas, a lesser author would leave some loose ends, but the reader feels satisfied with how Raphaelle's story develops, while awaiting the follow-up, Capricious. I am happy there will be a sequel because I was a little confused by the ending. I couldn't tell if Raphaelle will continue to be the rebel that seems to be her destiny, or if she will try once again into the Ella mold that would seem to make her life easier. I'm eager to find out; other mature readers will be, too. Audacious will be published on October 1st.